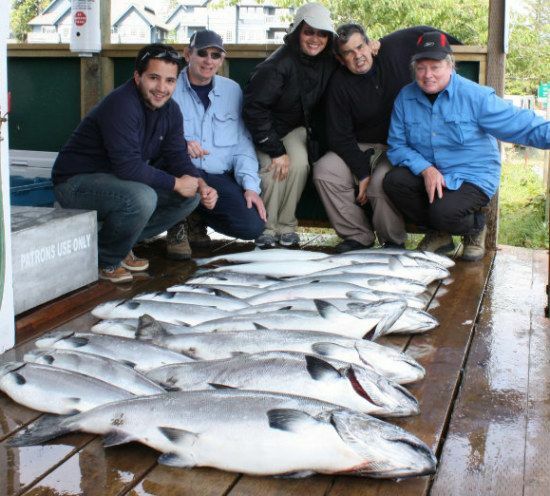 Vancouver Island is one of the top vacation destinations in North America and you need to experience salmon and halibut fishing here! With a land mass about three quarters the size of Switzerland, and stretching nearly 280 miles long from tip to tip, Vancouver Island is bigger than most people think. Although the island is only about 30 to 50 miles across, in most areas the mountainous terrain of the central island limits east to west crossings. The highest peak on the island rises almost 9000 feet above sea level. The west coast of Vancouver Island is mostly uninhabited, with the exception of Ucluelet and Tofino. Victoria lies at the southern tip, and Ucluelet and Tofino are about half way up the island on the west side. It is well worth the trip here to experience breathtaking scenery and walk the trails in a serene environment. Of course we love the fishing here and know that you will too! We often have days of 20-50 Chinook hooked and we are expecting Chinook numbers to increase as rivers are restored all along the coast. British Columbia is famous for its Chinook fishing and we are getting more and more people calling us because Alaskans referred them here as Chinook numbers continue to decline there. Keep in mind Chinook are King of the salmon and that is what we are known for. There are five types of salmon and Chinook and Coho are the most popular. We are fortunate to have large numbers going by us every summer of Chinook and Coho here on the west coast of Vancouver Island. Check out our fishing packages to book your vacation! Though Alaska gets more attention from the media, we get to experience some of the best Chinook, Coho and Halibut fishing the coast has to offer. (Read more about Alaska vs Canada fishing here). Of course don’t forget all the humpback whales, dolphins, sea otters, sea lions and seals you will get to see here. We are situated very close to many of the best feeding areas for salmon which makes this area very special. Areas on the east side of Vancouver Island that were once known for fishing, (such as Campbell River), have seen a major decline in the past 25 years. Many salmon now migrate to the west coast, to areas such as Ucluelet, and that means great fishing for all who come out there. It is important to do your research when booking your vacation in a short window of time! 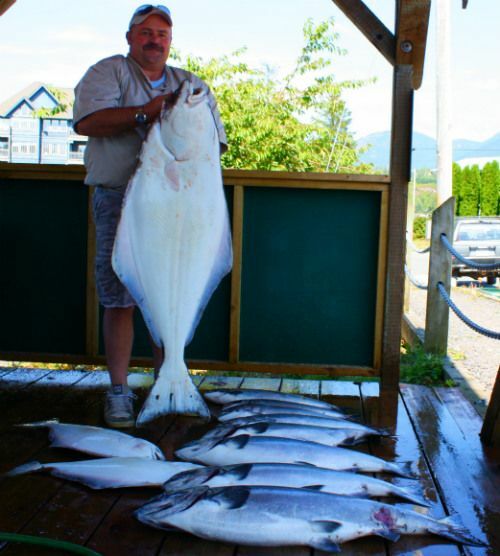 Halibut also are abundant on the west side of Vancouver Island and many people love to catch Halibut! One of our most common requests is to catch halibut and there are plenty of halibut here! Find out more about our fishing packages or day trips and of course watch our fishing videos! The halibut fishing is best from May to late August in Ucluelet. During winter months you can catch halibut all winter long in Victoria. During winter months check out our Victoria fishing charter page. Read more about getting here from Vancouver, Victoria, Seattle and Portland.